These highly social insects live in colonies that consist of dozens to several thousand individuals. The Black Carpenter Ant is the most common in this area. They typically like areas that have moisture problems – such as roof lines & window frames. 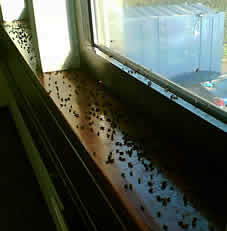 Signs of activity are piles of saw-dust & dead ants ejected from the colony. Carpenter ants forage in early spring because of cooler temperatures. 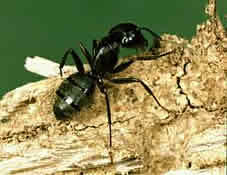 Carpenter ants enter a state of dormancy during colder weather. They produce glycerol which keeps them from freezing. These insects like to travel from outside to inside the structure, and because of this we recommend an exterior treatment. This way when the ants forage through the barrier they take the chemical back to the colony which will eventually destroy them. These large black files that show up in your house from late fall to early spring are the common cluster fly. They cluster on the sunny side of your home. Cool temperatures cause the files to enter your house through cracks & crevices around windows & siding. Once inside they hibernate until warmed by the sun or your home. We recommend an exterior treatment to keep them out of your home. these common pests show up the same way the cluster fly does. They tend to come out on the warm fall days and cluster to the sunny side of your home. We recommend an exterior treatment as well. These pests adapt to every human environment. Mice & Rats can transmit diseases and parasites to people and animals. Once inside a structure they can find food, make a nest and reproduce at a very fast pace. Breathing in their urine & excrement can cause serious health problems. They can also do structural damage and are the cause of many electrical fires. There are several different species of Bees & Wasps – all have different nesting habits. Their nests are usually suspended beneath horizontal surfaces such as overhangs & decks. They consist of a layer of cells that usually grow larger then 6-8 inches in diameter. 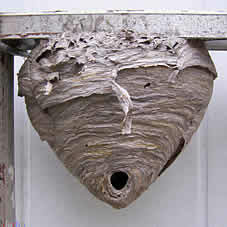 Each nest can contain one to several hundred wasps. These nests are often found hanging off the side of a shed or a tree. They resemble a soccer ball – a large grayish sphere with one entry at the under side. Primarily nest in the ground but can often be found in attic crawl spaces and wall voids. Each nest can contain 1000 to 5000 yellow jackets. The nest does resemble the Bald Face Hornets nest. These nests are usually located in wood. 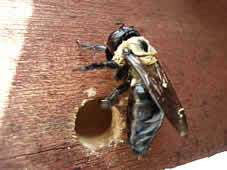 These bees bore a hole in the wood – take a 90 degree angle and lay their eggs. We dust the holes and seal them in to keep them from escaping. They are unable to bore there way out before dying from the treatment. We like to do two treatments – one in May and then again in July. This helps keep them out of your home and keep pesky cobwebs off the exterior of your home.